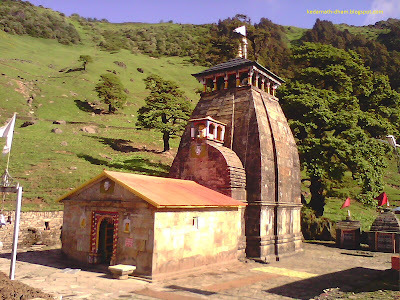 Madymaheshwar temple located in kedarnath himalaya range of Rundraprayag district in uttarakhand,India. this temple is dedicated to lord shiva and situated an altitude of 11473 ft.
History of Madmaheshwar Temple -It is believed that Madmaheshwar temple is built by Pandava’s( heros of mahabharata war) over 1000 years ago. when pandavas seeking Lord Shiva in hope of Liberation from sin of killing their own kith and kin in battle of Mahabharata (Largest Hindu Epic). Lord Shiva did not want to viewable (दर्शन) to pandava’s in own disire. so Lord Shiva escape to Kedarnath Himalaya range. lord shiva disguise own body to form of buffalo and dived in marsh land of kedarnath area but pandavas coughed him while lord shiva trying to go underground at here and then lord shiva gave DARSHAN and vanish the sin of killing their own relatives. In later years, that part of body of lord Shiva in form of buffalo which was not underground is worship in kedar Nath form at Kedarnath temple. the middle (मध्य) part of body worshiped at madmaheshwar . the other part of body worshiped as following places in Uttarakhand.